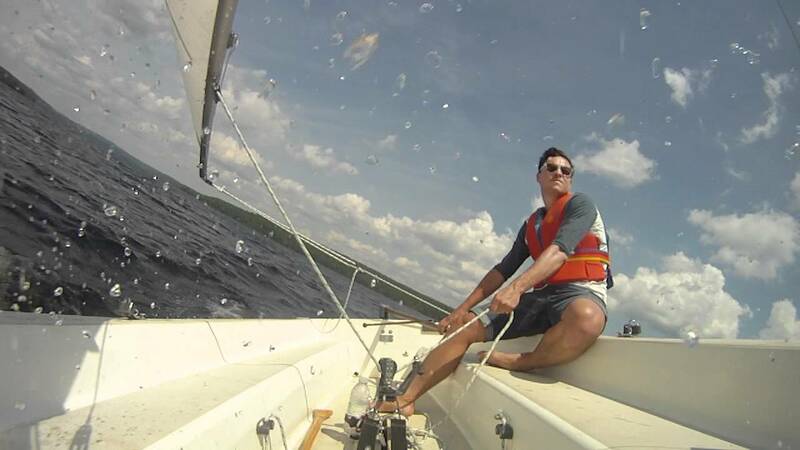 July 2015 – Which Sailboat? 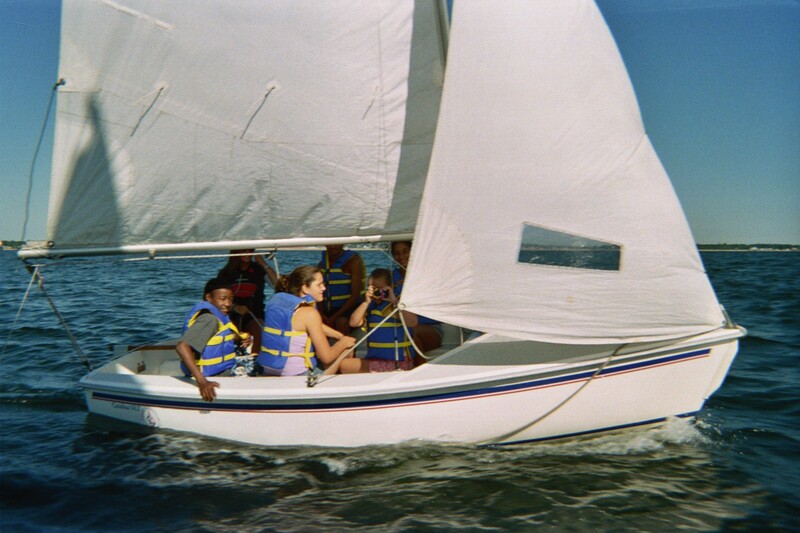 The Catalina Capri 14.2, known later as simply the Catalina 14.2, is an excellent sport sailboat and day sailer oriented toward family and youth use. The boat was designed by Ted Carpentier and Frank Butler of Catalina Yachts. Catalina derived the boat from the Omega 14 produced by Frank Butler’s Coronado Yachts prior to the formation of Catalina Yachts. After the formation of Catalina Yachts, the Omega 14 design was modified by adding a foredeck and a cuddy beneath the foredeck to create the Capri 14.2. Since 1983, over 5,200 Catalina 14.2s have been built. Production continues. The Catalina 14.2 benefits from its large production volume, long production run, that its manufacturer is still in business, and a plethora of parts continue to be available from the manufacturer and Catalina Direct. Active Catalina 14.2 class racing fleets and events exist but are limited compared to some other small sailboats such as Flying Scots, Moths, and Lasers. Presumably, this is because of the boat’s intended purpose and reputation as a family sport boat and day sailer, rather than a class racing boat. Three models of the Catalina 14.2 have been produced since 1983. The different models are popularly deemed “Mod 1”, “Mod 2”, and “Mod 3”. The Mod 1 models have a single open space below decks and came from the factory with a marine plywood hatch to enclose the cuddy and the rest of the space. The Mod 2 models, introduced around 1990, had a fiberglass box glued inside the entrance of the cuddy, which while preventing water intrusion into the cuddy and the rest of the hull in the event of a capsize, also made the potential storage space in the cuddy inaccessible and made maintenance of the inside of the hull more difficult. Mod 2 models had a canvas covering over the hatch to hide the box. Six years later in 1996, Catalina introduced the Mod 3, which removed the fiberglass box and included a water-tight bulkhead at the aft end of the cuddy, making for three nearly water tight areas in the hull, including the cuddy with the hatch installed and a space under each cockpit seat. Mod 3 boats were delivered with a more durable and watertight plastic hatch for the cuddy. Also on the Mod 3 boats, the wooden splash guards at the aft end of the deck where removed and instead the deck was simply rounded up from the forward end of the cockpit coamings. The Catalina 14.2 hull is solid hand-laid fiberglass. The deck is also solid fiberglass laminate with a molded-in non-skid pattern. The deck is attached to the hull in Catalina’s standard shoebox design. Unlike larger Catalina boats intended for more rigorous sea conditions, on Mod 1 and Mod 2 models the deck is fastened to the hull only with chemical bonding – there are no mechanical fasteners. On Mod 3 boats, Catalina also through-bolted the hull-to-deck joint. Older Catalina 14.2s may suffer damage of the hull-to-deck joint so that the water-tightness of the joint is compromised. After suffering such damage, many owners strengthen the joint with mechanical fasteners with relative ease, as the joint is easily accessible at the gunwale. Due to the design of the Catalina 14.2’s gunwale and exposed hull-to-deck joint, installation of a rub rail can serve to protect the hull-to-deck joint from damage. Installation is straightforward. Several rub rails from Taco Metals in Miami, Florida work well, particularly this white flexible vinyl model with white flexible vinyl insert. The hull is stiffened with several plywood stringers beneath the cockpit, which also support the cockpit sole, reducing flex under foot. The seats normally flex under foot, which while initially unsettling, provides for a more comfortable ride. Due to the more rounded and thus stronger foredeck and the additional bulkhead at the aft end of the cuddy, Mod 3 boats are stiffer than Mod 1 and Mod 2 boats. While wood stringers could be cause for alarm, few Catalina 14.2s see enough water left in the hull to cause rot. If rot is discovered, replacing the stringers can be difficult due to tight working conditions inside the hull. A few owners with rotted stringers reported solving the problem by knocking out the old wood and pouring water-resistant closed-cell expandable foam under the cockpit sole and seats. Depending on the density of the foam selected, positive buoyancy is an additional benefit of such a repair. Water-resistant closed-cell foam is crucial for this application. The TotalBoat Liquid Urethane Foam Kit, 6 Lb Density, Closed Cell for Flotation & Reinforcement works well for this application, providing both structural strength and positive buoyancy. As delivered from the factory, the Catalina 14.2 lacks positive buoyancy materials in the hull. If the hull is allowed to fill with water, the boat will sink. 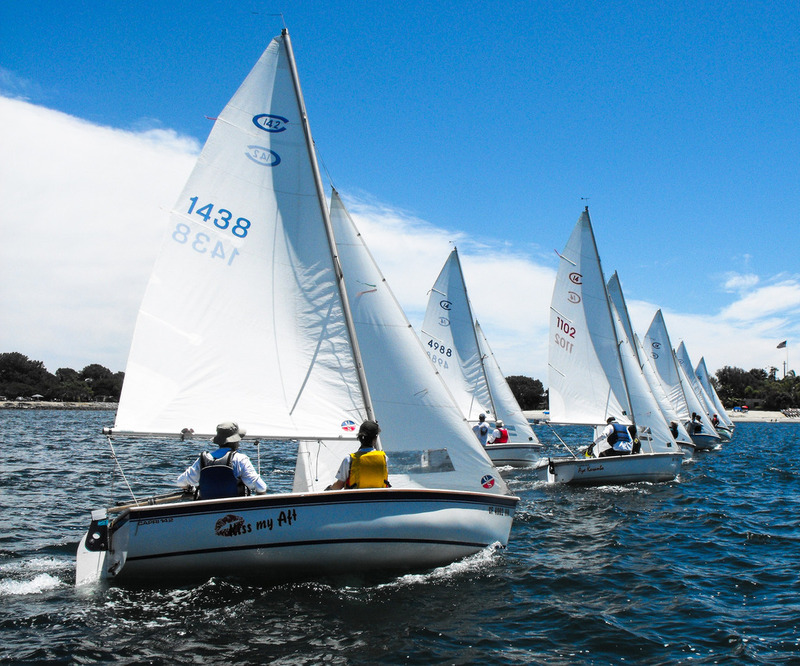 On Mod 1 and Mod 3 boats, securing the cuddy hatch board fast whenever underway is paramount. Catalina fitted foam plugs in the end of the mast on later boats, intended to provide some buoyancy in the mast to prevent turtling if capsized. However, the relatively broad beam of the boat limits the effectiveness of this design because most of the mast remains out of the water unless turtled. Many owners fit Hobie Baby Bob flotation bulbs (available on Amazon) to the top of their masts so that if the boat is knocked down, the boat does not turtle. The vast majority of Catalina 14.2s were delivered with a pivoting centerboard that kicks up if grounded. The centerboard is held in place when down by a shock cord that is connected from the aft end of the top of the centerboard to the transom at the end of the cockpit. The rudder also kicks up. Earlier boats have a solid wood centerboard while later boats have a foam-cored fiberglass centerboard. Rudders are wood or foam-cored encapsulated in fiberglass. Solid HDPE rudders are available from Catalina Direct. A medium-aspect fixed keel was also offered that added 200 lbs of ballast to the boat, which makes her slower but more stable, closer to an older-style traditional day sailer. Catalina named the boats with the fixed keel the Catalina 14.2K. As a semi-planing boat displacing little water, the centerboard model requires no centerboard trunk. The centerboard simply slides through a slot with only a few inches separating the floor of the cockpit from the water below. With enough speed, water can spray up through this slot into the cockpit. Catalina Direct offers a canvas gasket to surround the centerboard in the slot, which prevents this spray. 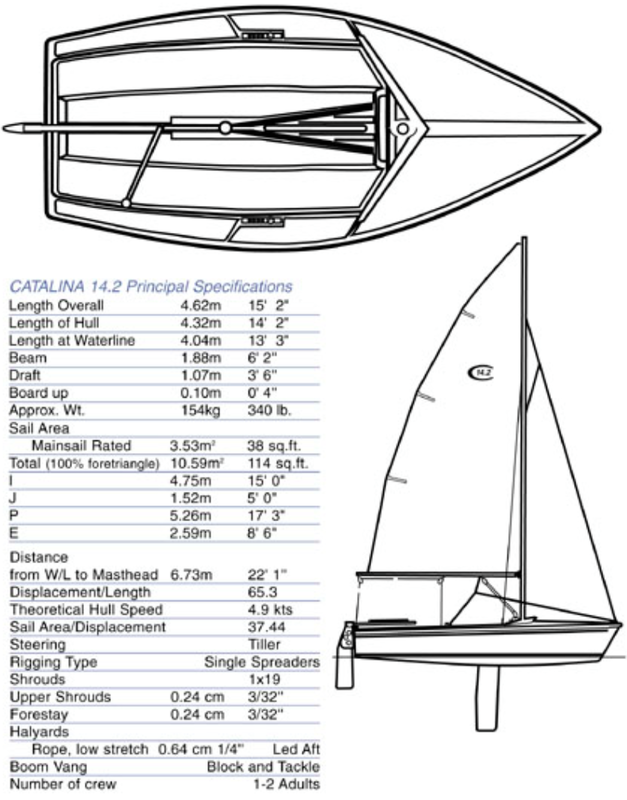 The Catalina 14.2 is rigged a as a fractional sloop with a self-tacking jib. The mast is anodized aluminum and supported by a stainless steel headstay and single set of swept-back anodized aluminum spreaders with stainless steel shrouds. The shrouds include adjustable brackets rather than turnbuckles that make rig adjustments quick if not entirely precise. However, the headstay includes a turnbuckle which can be used to achieve precise rig tuning. There is no backstay, which makes un-stepping the mast easier and frees up the cockpit under sail. The rig is very light-weight so that one person can ease the mast down when un-stepping and push it up when stepping, although another person is handy to guide the mast with the forestay. All other rigging hardware is stainless steel. In 2012, Catalina changed to a Selden made rig. From the factory, the boom has no uphaul so that when the mainsail is dropped, the boom falls into the cockpit. 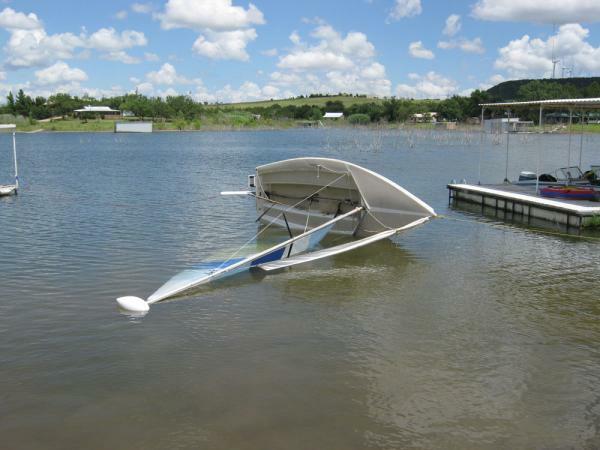 Some owners install an uphaul, rigid boom vang, or boom kicker to prevent this. As appropriate with a family sport boat or day sailer, all control lines are easily accessible from the cockpit. The mainsheet is managed from a stout spring-mounted pivoting block and jam cleat in the center of the cockpit. Jib sheets are managed from jam cleats on the side decks. The side decks also include a jib car track and cars that allow precise adjustment of jib sheeting angle. With sails of this size, no winches are necessary. The cockpit of the Catalina 14.2 offers good sole depth, seat width, and coaming height for relative comfort in a sport oriented boat. The coaming height and side deck height may be considered low for some less interested in an exciting sail, or more accustomed to day sails in a Flying Scot or a more traditional day sailer design. The cockpit seats are long enough to sleep upon. The relatively small surface area of the cockpit sole, cockpit seats, side decks, and forward deck are small enough to prevent much flex. Forward of the cockpit above the cuddy is a solid deck which is handy when dealing with the jib although feels less than secure in rough water. The side decks are reasonably wide as well. The only brightwork on the Catalina 14.2 comprised splash guards installed at the front of the cockpit and above the hatch to the cuddy, only on Mod 1 and Mod 2 boats. These boards are easily removed for complete refinishing if necessary. Mod 3 boats had this brightwork eliminated. The Catalina 14.2 can be a very exciting boat to sail. Hiking straps were installed throughout the cockpit from the factory. With its semi-planing hull, the boat achieves speeds great in excess of a displacement hull sailing boat. Its relatively deep centerboard and rudder provide excellent grip for pointing to windward. Riding close to the water, the boat’s occupants easily sense the speed at which they glide over the water. Due to its semi-planing hull and small size (and like most small sailboats), the Catalina 14.2’s pointing ability suffers immensely with blown out or otherwise worn out sails. The Catalina 14.2 did not come from the factory with any auxiliary propulsion, but an outboard motor mount was an option. Many owners use rowing paddles for auxiliary propulsion, but due to the beam of the boat and the orientation of the side decks, paddles are difficult to use. Many owners install small outboards, 1-3 h.p. are more than adequate for propelling the boat. Electric trolling motors are a popular choice for auxiliary propulsion with a battery installed at the aft end of the cockpit against the transom or in the cuddy. Either way, the battery should be installed in a watertight battery box secured in place with mounting hardware. Due to the easily-driven semi-planing hull, electric trolling motors are an effective means for auxiliary propulsion, with only the smallest 30 thrust-lbs models necessary for adequate propulsion. For owners interested in sailing into a headwind off a beach or against a tide, auxiliary propulsion is paramount. The Catalina 14.2 is easy to trailer with nearly any vehicle due to its light weight of 340 lbs. Due to its light weight, trailers require only a single axle. The relatively flat bottom and retractable centerboard make trailers intended for power boats work as an effective trailer. 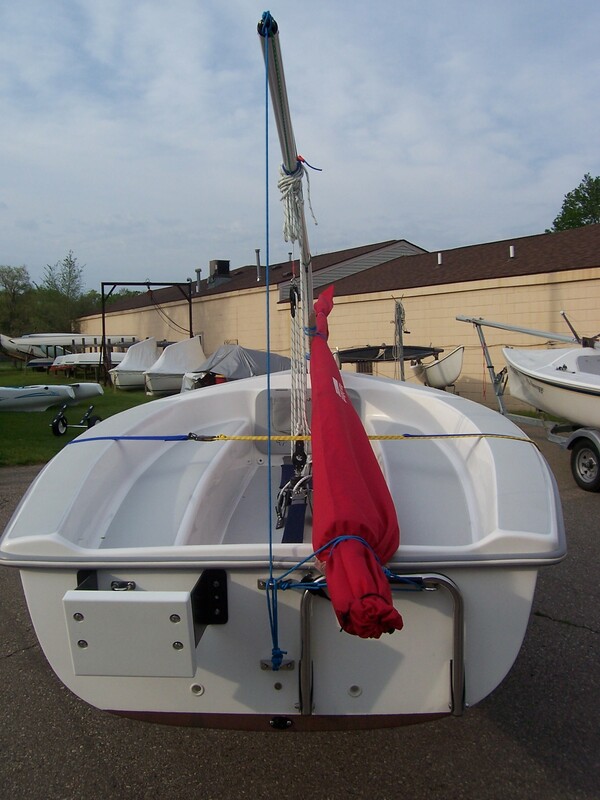 Trailering is easy due to the boat’s simple rig – only the forestay must be disconnected to unstep the mast. In addition to an excellent family sport boat and day sailer, the Catalina 14.2 also makes an interesting tender for the right liveaboard or cruiser. With its weight of 340 lbs, the boat can be rigged for davits or simply towed if the sailor is not against towing a dinghy. 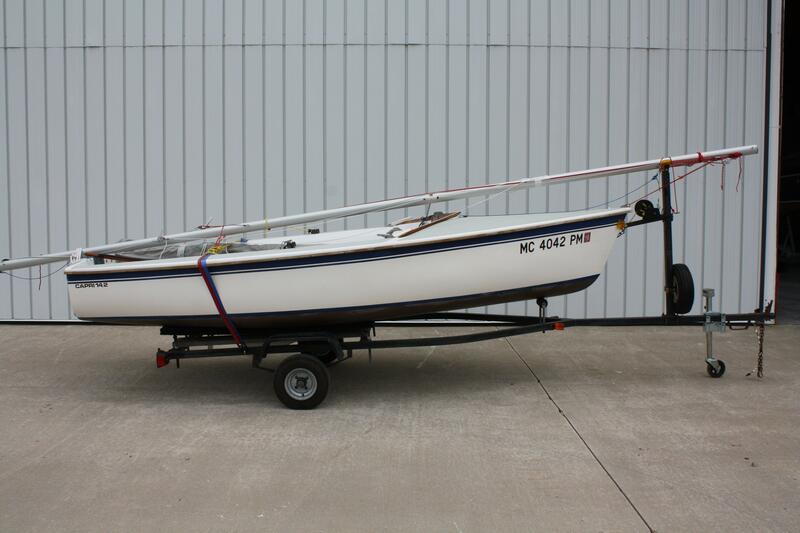 Despite being a semi-planing boat and having an open slot for the centerboard in the cockpit sole, the Catalina 14.2 with its wide flat bottom has more initial stability than most tenders and can be well laden with crew and supplies without shipping water through the slot. However as the boat is laden, its ability to point to windward suffers greatly. The same owner who reports sailing with his family, children, and camping supplies, also reports being unable to point better than a beam reach without auxiliary power as the boat was so overladen. With a larger electric trolling motor, large battery installed, and combined with a solar panel for charging the battery, the Catalina 14.2 can power through adverse currents with excellent if not unlimited range. Due to the excellent build quality and simplicity of the Catalina 14.2, the ready availability of spare parts, and that the manufacturer is still in business producing new Catalina 14.2s, resale values of the Catalina 14.2 remain high. New boats sell for over $6,000. Nevertheless, neglected Catalina 14.2s can be had on the used boat market at a steep discount, making the boat a potentially excellent value on the used market. Prices vary widely between $1,500 and $4,500, depending on the year of the boat, installed accessories like motors, condition of the sails, hull condition, the condition of the trailer if included with the boat. Neglected boats can be made ship shape for a modicum of investment compared with larger boats and typical tenders. 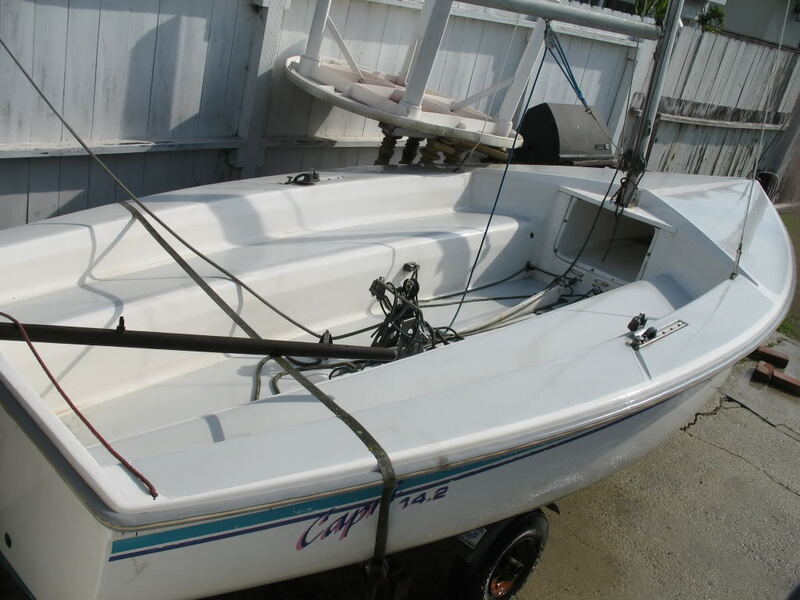 At the time of writing, only two Catalina 14.2s are available on Yachtworld.com, but many making good options are available on Craigslist.